While you’re in-between jobs, it’s hard to make ends meet. The bills keep coming, and you may have to keep up with current expenses as well as repay the debt that you took on years ago. Fortunately, some loans have features that give you breathing room while things are tight. 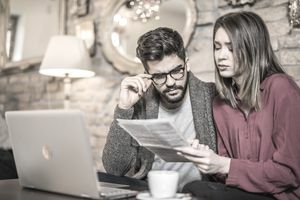 It’s always best to continue making payments on loans (you’ll have to pay it off eventually), but that simply might not be an option during periods of unemployment. Unemployment deferment allows you to temporarily stop making payments on your student loans while you are unemployed. How "Unemployed" Is Defined: You don’t necessarily have to be unemployed to qualify for a deferment. “Unemployment” is triggered by working less than 30 hours per week (or a situation in which you work full-time, but the job is not expected to last more than 90 days). Deferment First: To start deferment (and stop making payments) you’ll need to apply and qualify – it’s not automatic. If you stop making payments prematurely, you risk damaging your credit. Applying for Deferment: To make it official, apply for a deferment with your loan servicer (the company that you send payments to each month). As you might expect, you’ll need to fill out forms and request that your loans go into deferment. Qualifying for Deferment: You’ll need to document your case to qualify. There are two ways to claim that you're eligible: attest that you're actively seeking work, or show that you're eligible for something like state unemployment benefits. Once Approved: You can stop making payments once you receive official word from your loan servicer. However, you’ll need to stay in contact with your loan servicer. LoanTypes: Federal student loans, which are generally the most borrower-friendly, offer the best chance for an unemployment deferment. This page primarily covers the rules for deferment of government loans. Private lenders might also allow you to postpone payment, but the rules may vary. Contact your loan servicer for complete details. You can stop making payments in deferment, but interest still might be charged to your accounts. If you have subsidized loans, the interest will be paid for you. However, with unsubsidized loans, you'll either need to pay those interest costs every month or add those interest costs on top of your loan balance (known as capitalizing the interest). Capitalizing interest costs might seem attractive – you can deal with it later – but this can become expensive. Your loan balance will actually increase. As a result, you’ll have to pay off what you borrowed as well as the interest that built up during deferment (plus you'll be paying interest on the interest that gets added to your loan). During deferment, you should have the option to pay your interest costs each month. This would be a smaller payment than your scheduled payment, and it is often wise – it’ll keep your debt from growing. Your deferment will go in six-month cycles: every six months, you'll need to reapply to stay in deferment – this isn’t automatic. That means you'll have to (again) sign documents and attest that you are still either actively seeking employment or receiving state unemployment benefits. If your first loans were made before July 1, 1993, your deferment will last a maximum of two years – otherwise, your deferment can last up to three years. To stay in deferment, you need to seek work actively. Technically, this is defined as at least six "diligent" attempts to find work in the past six months. It’s best to keep records of your efforts at finding employment. Unfortunately, you can't just wait for employment that you think is suitable - most lenders require that you take any job you can get, regardless of income or career prospects. If you're eligible for unemployment benefits from your state, you can document your eligibility for deferment by showing that you currently receive benefits from your state. A recent unemployment check should serve as sufficient proof. Lenders can always request any additional documentation that they feel is necessary, so keep good records on any job interviews, note any employment programs you're participating in, and be prepared to back up any claims you’re making. Once you’re working again, your deferment should end, and you'll need to start making payments again. Contact your lender and let them know that you’re no longer eligible for the deferment. If you're still unable to afford your payments, communicate with your lender before you start missing payments. There might be other options, including other types of deferment or adjustments to your loan and payment. Income-driven repayment programs can make repayment easier when your income is low. Payments are calculated based on your current earnings, and you might even be able to skip payments until you’re back on your feet. Forbearance is another way to stop making payments temporarily, and you might be able to qualify for forbearance if deferment is not an option. Contact your lender for additional alternatives. Depending on your situation, you might qualify for other programs. For example, military service or disability might make you eligible for certain benefits. Getting another loan to pay your student loans may be tempting, but it's risky. You'll only increase your debt burden, and you risk falling into a debt spiral. Communicate with your lender and explain your situation before you go deeper in debt.